What is Satin Chrome or Satin Chromium? Satin Chrome plating is an alternative finish to bright chrome and is a popular effect for many metal items, parts and components. 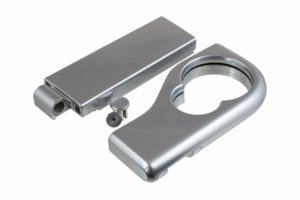 We can offer different types of satin nickel which have a profound visual effect on the finish. A very dark matt, semi matt, semi bright. This chrome finish offers a duller and more subtle appearance compared to bright chrome and is therefore a fantastic option for a modern look. Satin chrome is often used for items around the household and creates a contemporary metal finish. Common products include: metal locks, door handles, key holes, light switches, electrical power sockets, door numbers, light fittings, taps and shower heads. This finish is also regularly employed for golf clubs. Chrome plating is produced by the technique of electroplating a thin layer of chrome onto a electroplated satin nickel coating. Chrome plating can be used for decorative purposes, but also provides other benefits such as corrosion resistance, increased hardness and easier cleaning. As with bright chrome, the chrome plating technique involves electroplating a thin layer of chromium onto metal. Trivalent chromium which is an environmentally friendly process that produces a slightly greyish blue tinge. The hexavalent chromium which has some health and safety issues as a process but not as a finish and produces a more bluish tinge. Midland Polishing and Plating can provide a chrome plating solution to fit your individual needs, working on a wide range of metal substrates including; cast iron, zinc, aluminium, steel, brass and stainless steel. Our superior quality plating has previously been used on various components including; metal screws, bath taps and shower heads, electrical plug sockets, car parts, beer pumps and decorative items. Our large Wolverhampton workshop is fully equipped with the latest metal finishing equipment, and we constantly train our staff to keep up with the latest technologies. Satin Chrome is another finish available from the experts at Midland Polishing and Plating Ltd. For expert advice and further information please call +44 (0)1902 421 174 or contact us via filling our quick enquiry form.